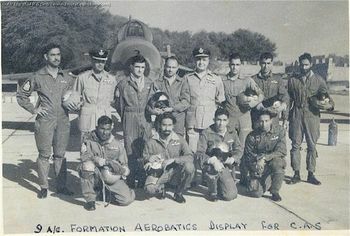 As against the prevalent perception, the first nine aircraft aerobatic team of the Indian Air Force was formed by No 7 Squadron, The Battle Axes, in late 1961. In fact, the first nine aircraft (Hunter Mk 56A) formation aerobatic display was flown on 06 Jan 62 on the occasion of the squadrons 20th anniversary. 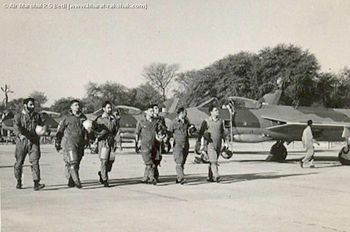 The team was led by the Commanding Officer, Sqn Ldr Bharat Singh (later Gp Capt) & comprised the Flight Commander, Flt Lt AK Mukherjee (later Wg Cdr), Flt Lt P Rawlley (later Sqn Ldr, died in 1965 war), Flt Lt RS Bedi (later Air Mshl), Fg Offrs DK Dhiman (later died as Gp Capt), Pritam Singh (died in Hunter accident later), H Kailasam (shifted to Air India), DR Nadkarni (later Air Mshl), SK Behal (later AVM) & Choudhary (died in 1965 war). 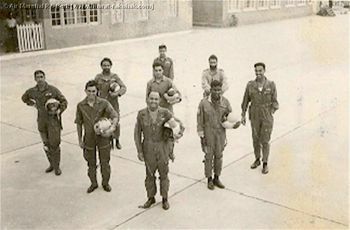 Each of these ten pilots, including one as stand by, was trained for two stations. 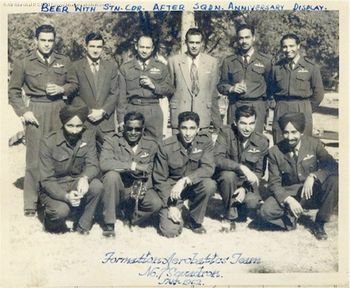 This saga of the nine ac team began when the two sister Sqns- Nos 7 (CO, Sqn Ldr McNeil) & 17 (CO, Sqn Kanwar Singh) were located at Ambala, after conversion on Hunters in UK. Having gained some experience, both sqns started to train their respective pilots for formation aerobatics. Gradually, a sort of unhealthy competition developed between them. 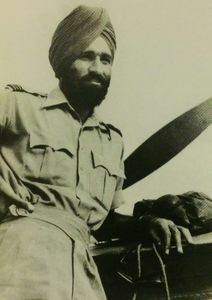 One fine day, this led to a mid air collision over Ambala airfield, involving Harry Bhagat & Lamba of 17 sqn. Fortunately, both ejected safely. At this stage, the command stepped in & designated 7 sqn (now under Sqn Ldr Bharat Singh) to form the nine ac aerobatic team. 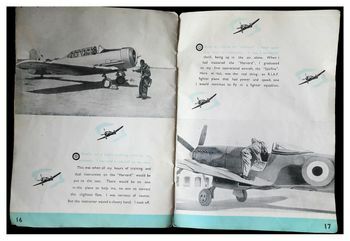 Consequently, the syllabus was made & each pilot was taken through it, till he reached the stage of being comfortable with nine aircraft. 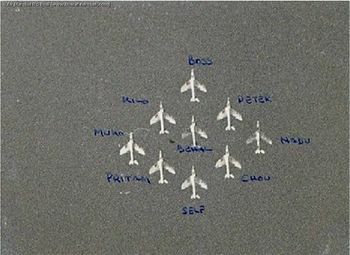 The nine aircraft used to get airborne in three vics, having lined up one behind the other. 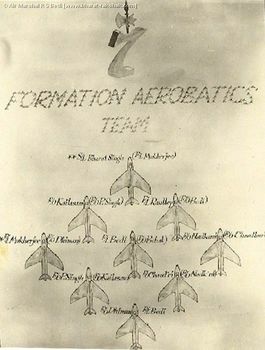 The formation used to form up over points East/West (Barara/Rajpura) and run-in over Ambala airfield, forming a figure of 7. 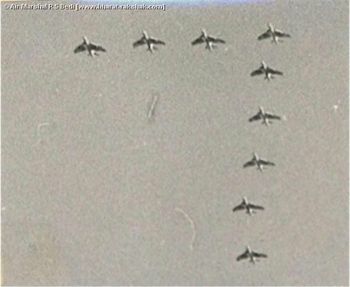 While winging over, the formation used to change into a Diamond and continue into a loop. This was followed by another wing over & a loop in the reciprocal direction. Likewise, two reciprocal barrel rolls, one each to either side, were executed. All manoeuvres were interspersed with a wing over to keep the formation in sight of the grand stand. The last loop used to commence as a Diamond & change into an Inverted Wine Glass during the upward vertical part of the loop, reverting to the Diamond in the downward vertical part, thus, executing two formation changes in a single loop. The last part of the display was the most spectacular to watch, wherein, a Double Bomb Burst was executed. As part of this manoeuvre, the rear five used to burst upwards, turning through 45O, while the leading four, would burst downwards, turning through 90O. 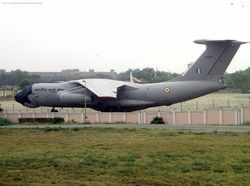 The nine aircraft used to reform over point East/West for a landing in three vics. The aerobatic floor for the display used to be 500 feet agl, with speeds varying from 180 to 420 knots. It was very difficult to carry out a thorough debrief in regard to station keeping wile executing various manoeuvres. 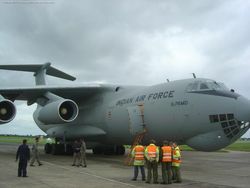 For this purpose, a Hunter Mk 66 (trainer) with a G90 cine camera, flown by late Flt Lt Vijayan was used. However, this often led to contentious arguments about each others position keeping, since it was not easy to discern clearly whether the formation was on its back or otherwise. 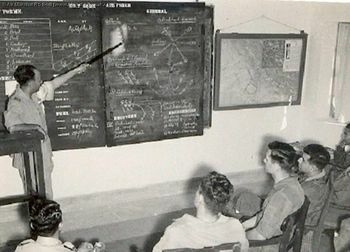 Once the team was fully ready, a display was put up for AOC in C WAC, on 17 Mar 62, followed by another display for the CAS, Air Mshl AM Engineer on 28 Mar 62. 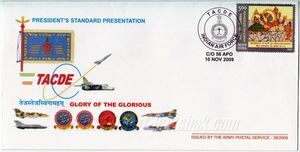 This legacy was carried forward for quite some time by subsequent sqn cdrs, including the Late ACM Katre. - The IAF's first formation aerobatics team by Gp Capt Kapil Bhargava. Lto R – Pritam, Natty, Self, Rawlley, Dice, Bharat, Behal Note – The film never got made because the cameras could not capture anything!!! as captured from a Hunter T.66.